Like the idea of catching waves? As a cow? A purple cow with sunglasses on? 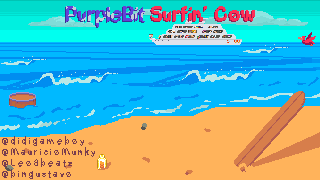 I hope you do because a brand new Made in GameMaker game: PurpleBit Surfing Cow is out on Google Play store and it is completely Free to play with no ads or in app purchases at all. A true tribute to Purple Cow Studio which has a diverse and great community behind it and I personally wanted to know a bit more, so I sat down with Luiz Gustavo from Heavy Sheep Games to get some insight on the “Why” and “How” this game was created. Let’s just get right to it and ask the main question on everybody’s mind: Why the name and why a cow as the main character? There has to be a story behind this. When I read the technical development summary for this game I noticed that it was started in GameMaker Studio 2 but then later converted to GameMaker Studio 1.4. Can you explain more details about this and how complicated was the switching process? Wow, that sounds complicated and I know there is so much in GMS 2 that it is very hard to open up GMS 1.4 and know there are so many cool features in GMS 2. What else do you miss in GMS 2 now that you are back on GMS 1.4? Now one thing I really like about PurpleBit Surfing Cow are the unique graphics style. Did you guys make all the graphics in house? I saw the sound effects and music were done by Léo Cardoso and Maurício Costa, are they part of the group? Or was this outsourced? That’s great to have such a diverse group of skills in Heavy Sheep Studio. Mooving [bad joke…sorry] on to the actual programming, did you use any GameMaker MarketPlace Assets or did you code everything yourself? Impressive, so then I have to also ask: What were the biggest obstacles or issues you had while developing the game? I want to take a minute here and talk about controls because in a game as unique as this controls are a very difficult game design problem. Can you explain why you chose the controls? I found the controls are very intuitive to use and seem like a great fit. Did you try other controls first? It is very insightful to hear about the internal processes and decisions that go into making a game, just as important though is finding out expenses. How much did development cost for Purple Surfing Cow? That is the great thing about being on a team where all the skills are diverse and cover all the major facets of game development. Now, if you can tell us: How much revenue have you made so far? What a generous gesture and I am sure this game will bring happiness around the world. 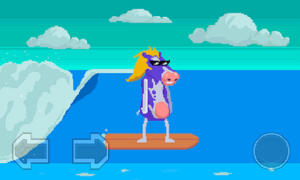 Are there any plans on porting Purple Surfing Cow to other markets like IOS, Kongregate or Steam? Switching over to the actual gameplay, and I won’t spoil any of the big surprises but I have to know why some of things in the game show up; specifically the cruise boat whose passengers throw bottles at our main Cow? Incredible, that is a just a great way to include not only gameplay but personal touch as well. Also, the game is quite hard, what is the best time someone has gotten so far? Another interesting question I had been wondering about: Do you notice the game is more popular in certain countries? Like Brazil? Well Luiz, truly fantastic job on PurpleBit Surfing Cow and I think it is great Heavy Sheep Studio made this as a tribute and completely free. Any final words or things you want to say before we end?